When the United States stopped backing dollars with gold in 1968, the nature of money changed. All previous constraints on money and credit creation were removed and a new economic paradigm took shape. Economic growth ceased to be driven by capital accumulation and investment as it had been since before the Industrial Revolution. Instead, credit creation and consumption began to drive the economic dynamic. 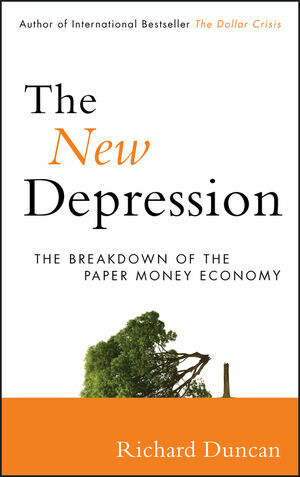 In The New Depression: The Breakdown of the Paper Money Economy, Richard Duncan introduces an analytical framework, The Quantity Theory of Credit, that explains all aspects of the calamity now unfolding: its causes, the rationale for the government's policy response to the crisis, what is likely to happen next, and how those developments will affect asset prices and investment portfolios. In his previous book, The Dollar Crisis (2003), Duncan explained why a severe global economic crisis was inevitable given the flaws in the post-Bretton Woods international monetary system, and now he's back to explain what's next. The economic system that emerged following the abandonment of sound money requires credit growth to survive. Yet the private sector can bear no additional debt and the government's creditworthiness is deteriorating rapidly. Should total credit begin to contract significantly, this New Depression will become a New Great Depression, with disastrous economic and geopolitical consequences. That outcome is not inevitable, and this book describes what must be done to prevent it. Alarming but essential reading, The New Depression explains why the global economy is teetering on the brink of falling into a deep and protracted depression, and how we can restore stability. Richard Duncan is the author of two earlier books on the global economic crisis. The Dollar Crisis: Causes, Consequences, Cures explained why a worldwide economic calamity was inevitable given the flaws in the post-Bretton Woods international monetary system. It was an international bestseller. The Corruption of Capitalism described the long series of US policy mistakes responsible for the crisis. It also outlined the policies necessary to permanently resolve it. Since beginning his career as an equities analyst in Hong Kong in 1986, Richard has served as global head of investment strategy at ABN AMRO Asset Management in London, worked as a financial sector specialist for the World Bank in Washington, D.C., and headed equity research departments for James Capel Securities and Salomon Brothers in Bangkok. He also worked as a consultant for the IMF in Thailand during the Asia Crisis. He is now chief economist at Blackhorse Asset Management in Singapore. Richard studied economics and literature at Vanderbilt University and international finance at Babson College, and, between the two, spent a year travelling around the world as a backpacker.